The AfriCat foundation is a non-profit organisation committed to long-term conservation of Namibia’s large carnivores and is led by a passionate and knowledgeable staff. AfriCat presents you with a unique opportunity to see the big cats and other animals on the reserve and at the same time, learn about the modern day human/wildlife conflict and how this is affecting the status quo. The animals on the reserve are by no means tame, and you cannot pet them (that's not the idea), but you are able to get fairly close. Unfortunately, for various reasons these carnivores cannot be released back into the wild, they were once either pets and are too used to humans, they have injuries that would disadvantage them in the wild, or they have been unable to survive in the wild once they had been rehabilitated by AfriCat. In these instances, where they cannot be released back into the wild, they remain on the reserve in as close to natural surroundings as is humanly possible, they become ambassadors for their species and in a round-about way, educators. A typical day visit involves a short guided drive up to the visitor centre where you will meet some of the ambassadors. Your guide will be able to answer any questions you may have and also share his wealth of knowledge on the big cats and other species, he will explain the work of the AfriCat Foundation and help you get the perfect photographs. You will also have some light refreshments. There's a mountain hike up the hill on offer that will give you a bird's eye view of the entire reserve or a mountain hike down the hill for a swim in the camp-site pool. Children are welcome but those under three won't be able to take part. The Okonjima experience is not about 'walking with lions' or 'cuddling cheetahs' but about observing them in their natural habitat and learning from these magnificent animals. Everything AfriCat does here is done with the intention of education and preserving these species so they will continue to thrive in the wild for generations to come. 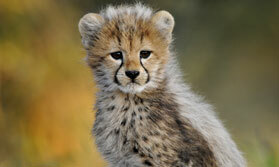 This fantastic and unique experience takes place at the AfriCat Visitor Centre on the Okonjima Reserve. 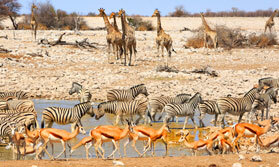 The reserve is about 2 and a half hours north of Windhoek. The AfriCat Day Visit can be done any time of year. There are morning and afternoon visits, each lasting about 1 and a half hours. 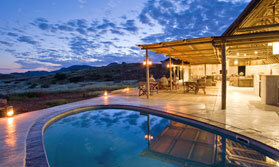 Why not enhance the AfriCat day experience, and stay on the Okonjima reserve for a couple of nights? You can stay at Okonjima Plains, or the more exclusive Okonjima Bush Camp, a two or three night stay would be well worth it. You will get to see more of the reserve, enjoy game drives and the enthusiastic and knowledgeable guides will have you hooked and wanting to spread the AfriCat message far and wide!